The new build is numbered 11D5099e and is available to developers from the iOS Dev Center. The download for the iPhone 5s firmware is about 1.4GB. 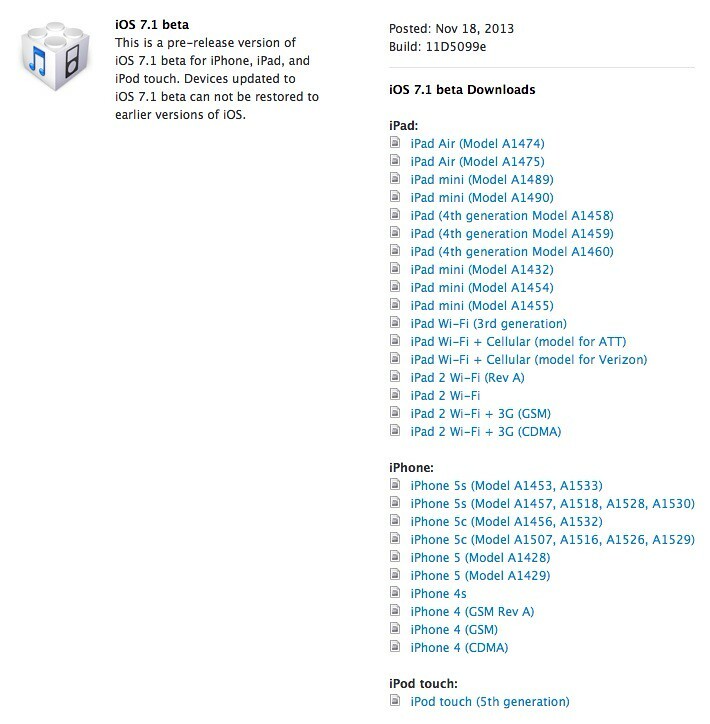 Apple warns that "Devices updated to iOS 7.1 beta can not be restored to earlier versions of iOS. Registered development devices will be able to upgrade to future beta releases and the final iOS software." However, this has not always been the case. The Release Notes for the new firmware have been posted online. You can view the fixes listed below. ● Previously, if the server-side closed an HTTP request with TCP FIN without sending any bytes of HTTP header or HTTP body, NSURLConnection would synthesize an empty HTTP/1.1 200 OK response. This is now fixed, and the request will result in an error instead of a successful load with a synthesized response. ● Previously, text drawn with CTFrameDraw did not correctly place lines to account for the paragraphSpacing attribute of NSParagraphStyle. This has been addressed in iOS 7.1 beta. ● If loaded with GLKTextureLoader, pngcrush images that have alpha were not unpremultiplied. ● When sleeping or waiting for extremely precise time intervals, timers were delayed by up to 1 millisecond. ● The MCSessioninitWithPeer: method has now been implemented properly.